Golden ratio tattoo at first may seem just as a simple spiral, but it has a very profound meaning. But of course, despite the mathematical and geometrical background, it is a beautiful tattoo. No matter how we put it – body art is all about visuals. If it doesn’t look good, no one will want to get it on their body. So, the golden ratio is a beautiful image that looks great on both men and women. But let’s take a more in-depth look at its history and origin. At first glance, this famous symbol that you have probably seen before looks nothing more than a simple spiral. But, apart from being an awesome tattoo, it also has a profound meaning. You may also have learned about it at school as the Fibonacci spiral, the golden spiral or the golden number. The golden ratio is a mathematical formula. You can find it when you divide a line into two parts in a way that the whole line separated by the shorter piece is also equal to the shorter part divided by, the longer part. This sequence of numbers goes on to the infinity. We can find this number repeating throughout the history. The length of each side of the Giza pyramids base is close to the golden ratio. Also, we can see it on the proportions of the rectangle which forms the golden spiral. Because of this ratio, the square is the most visually satisfying geometric form of all. During the Renaissance, many artists used the golden ratio as the basis for their paintings, buildings and other artworks. Leonardo Davinci used the ratio in his famous painting of the Last Supper, Mona Lisa and Vitruvian Man. You can also find the golden ratio in many other forms of science and nature. For example hurricanes, spiral galaxies, pinecones, flower petals, shells, tree branches, our fingers and even DNA. These and many other objects in our universe display the Fibonacci sequence. If you want to learn more about this incredible symbol, check out this excellent article at livescience.com. 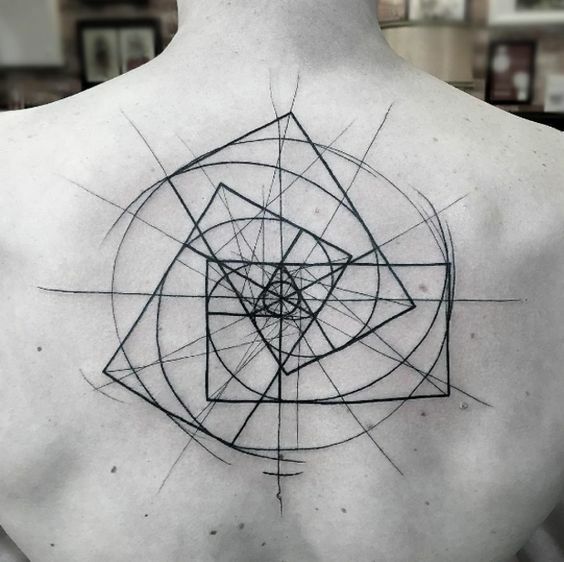 What does the golden ratio tattoo mean? As you can see, this is a symbol that repeats throughout the whole universe. So, a golden spiral is a symbol of wholeness. It is a connection between us and every other thing around us. Because of it, we all exist in one harmonious system. So, it is a perfect choice for spiritual people. If you like to think about the cosmos and how everything connects, – a tattoo fo a golden spiral is for you. From another perspective, it’s a symbol of pure science. So, at the same time, it represents both the mystic and scientific worlds. It’s one of those tattoo types that looks great on both men and women. Because of its simple and minimalistic form, you can ink it on almost every part of your body. The best size of golden ratio tattoo is middle or smaller. A tiny version of this tattoo will be difficult to see, and a large scale will look too stretched. Take a look at our collection below. We hope you’ll find that one idea for your next tattoo!